This page is for managing short and middle term development planning. Features on this page are considered major or significant improvements. General bugfixing does not need to go here although major bugs could end up in a “tasks for completion” section once we near a release. Features are divided into sections based on their stage of completion or planning. Each feature should have the names of any devs who are actively working on, planning, or responsible for the feature and who realistically think they'll be able to finish it in time for the release date. See the Future Versions and previous stable release planning pages for ideas, moving entries here as necessary. This is a list of tasks that generally need to be completed for any release to happen. Release schedule: Border of spring and summer of 2017? Open-source projects can become somewhat disorganized and kudzu-y. Brannock has some ideas for helping to keep things managed and sensible. We already use ##crawl-dev and the CRD mailing list for developer discussion and brainstorming. The dev wiki skipped one full release (0.19) but can be rescued. The wiki is a good place to keep everyone's personal ideas that they're percolating instead of hidden away in text files that no one else can access. We have several very useful documents (objstat, monster spawn distribution) hosted on Google Docs. I recommend we make a dev group with Google Groups for easier organization and access to these docs, instead of sprinkling them all over the learndb / private access. GitHub, where the main Crawl repository is currently stored, supports wiki and Project functions. We do already have this dev wiki, but keeping things centralized helps focus attention rather than hopping between multiple domains and styles. Could be something to consider, maybe? GitHub also has an issues tracker though I think Mantis is perfectly fine for this. Any other ways to keep in touch better? STEAM - We've had discussions in the past about releasing on Steam – I think it's about time that we get Crawl onto Steam, especially with a big milestone like the 20th release. There are multiple other roguelikes on Steam with a successfully-sized playerbase. We'll need to handle licensing issues, Greenlight, and whatever else Steam will require of us. Chequers and Brannock have been interested in pursuing this, but we have several other devs that need(?) to be involved to successfully reach this goal. These features are not yet in trunk but are being actively worked on or considered by one or more devs (but still may not make it into the next release or any release for that matter). If this falls through, other proposals set-up a roulette with Elf and Crypt's positions alone. Location awkwardness and loot-adjustment required of both branches. Remove mottled draconians - Concurrent with removing monster mottled dracos and dragons. Yellow draconians get their splashing behavior and short range on acid breath. (Brannock) Done. Remove mottled draconians - Mottled draconians are probably the most boring of draconian packs, draconian packs have too many varieties for their own good, and fire already has multiple representations. (Brannock) Done. Turn mottled dragons into acid dragons - Midgame-ish source of acid damage (aside from oklobs). Armour grants rCorr instead of rNapalm. (Brannock) Done. Remove draconian callers and zealots - Indistinct and bloated. See above about draconian packs. (Brannock) Done. New monster: draconian stormcaller - Smiting, summon drakes, Qazlal's upheaval. Rare: summon dragon. (Brannock.) Done. Remove hill giants / buff two-headed ogres - Also give hill giant spawn numbers to 2HO. Makes ogre packs somewhat scarier, and further distinguishes giants. (Brannock) Done. Swamp worms - at minimum, fix the thing where they randomly de-submerge while out of sight. possibly should replace their gimmick entirely, e.g. with reverse-trample (pull you backward along with them), or remove them; 'ambush predator' doesn't work very well on such a relatively weak enemy (for Swamp). Charms reform - People aren't happy with Charms due to percieved time / tedium costs in putting buffs up before fights, passive buff status veto'd. 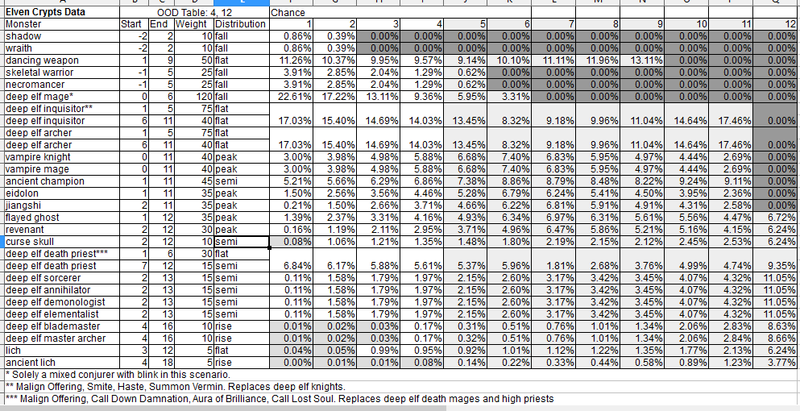 No satisfactory conclusions yet beyond Haste's 0.18 removal. Electric damage - make it consistently ignore half AC, rather than sometimes half (shock, lbolt) and sometimes all (static discharge, chain lighting). buff damage slightly for affected spells. Hepliaqlana - Keep an eye on balance; consider moving antimagic brand from hexer to knight to keep the latter more relevant later on. Wu Jian the Council God - by SteelNeuron. Should be tested in trunk. — dpeg 2017-01-12 16:56 Merged! New item type: Scarf - 0 AC, cannot be enchanted, always comes with an ego. Uses the cloak slot. Scarf, muffler, bandanna, babushka. (Brannock) All done! Potion of Mutability - Merge !curemut, !mut, and !benemut all into one item. Removes 2-6 mutations, adds 0-3 mutations, gives 1 good mutation. Intended to help encourage players to play the mutation roulette, and to help dampen the effect of getting a cripplingly bad malmutation (since this new potion is much more available than !curemut was) without letting them opt out of the mutation game entirely. There's always Zin for that. (Brannock, Lasty) Done. It should contain a line for regeneration rate (with pluses, like MR and Stealth). The column for amulet properties (Gourmand, Faith, Spirit, Harm, Reflect) is not really necessary: it is rare to have several of those properties, and it might better to only print such an entry when the effect is present? E.g. if you happen to have mutation resistance, then the %-screen should show: rMut +, but otherwise there needn't be a rMut line. Options menu - It'd be very good to have at least some rcfile options be toggleable in-game, automatically making corresponding edits to the rcfile.